The largest fire recorded in Europe this year may be disasterous for the most important population of Bonelli's Eagle in the Algarve. During August the blaze swept across the Serra de Monchique, Portugal, engulfing 27,000 ha of the area in just one week. The Natura 2000 protected reserve is a vital breeding site for the eagle, and one of the most important for the species in the whole of Europe, but there are fears the fire may have had devastating effects on nesting birds. While Bonelli's Eagles have suffered a drastic decline in the north of Portugal during the last few decades, numbers in the south have increased to the point where the national trend has been reverted. However, much of this success is due to the species nesting in trees, rather than cliff faces, in the south, and consequently the recent fire is of particular alarm. The fire engulfed 27 ha of land in the Serra de Monchique reserve (Marc FASOL). Joaquim Teodósio, head of the Land Conservation Department at the Portuguese Society for the Study of Birds (SPEA), explained: "In the south of Portugal, instead of nesting mostly on rocky cliffs, Bonelli's Eagles prefer to nest in large trees. This means there's a big risk that the fire could destroy not only the current nests, but also other trees where prospective pairs might have considered building new ones in the future." Although fires aren't uncommon in this type of habitat in Iberia, the recent blaze spread over an incredibly large range. 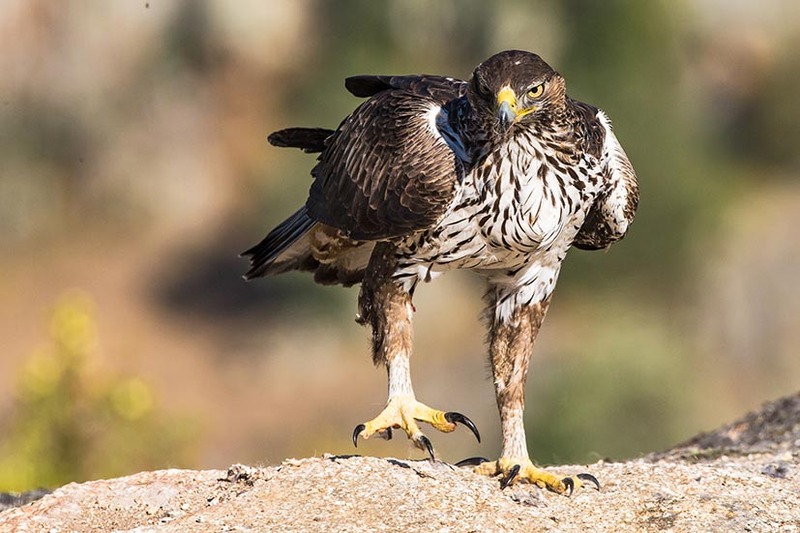 At least five pairs of Bonelli's Eagles are known to breed in the area that has been affected, and it's possible several nests may have been devastated by the flames. Other pairs, which hadn't built nests but were occupying nearby territories, may also have been affected or could still be at risk. The fire has largely ceased now, but the eagles will require close monitoring in the immediate future. Aside from nests possibly being engulfed by the fire, the short-term consequences for the various flora and fauna of Serra de Monchique could also have negative consequences for the eagles. The blaze will have killed many Red-legged Partridges and European Rabbits – key prey for Bonelli's Eagles. The speed at which these species can recover their populations is essential in order for the eagles to avoid food shortages. Initial fears are very much evident, but Rita Ferreira, from SPEA's Bonelli's Eagle Working Group, offers a more positive outlook: "If important areas within the territories are affected, and some pairs are left with no place to nest or feed, it's possible that there could be a reshuffling – pairs could redistribute themselves throughout the forest and use the space differently. This is what we saw in Serra do Caldeirão after the fire in 2012." In southern Portugal, the majority of Bonelli's Eagles nest in trees (Ron Marshall).